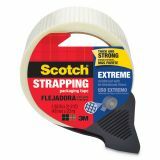 Extra security—with filaments down the length and across the width, tape is difficult to hand-tear in any direction. 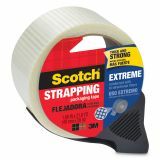 Fiberglass filaments run in a bi-directional pattern, providing high tensile strength across the width and length of the tape. Aggressive adhesive sticks to fiberboard and other substrates.  Note: A minimum quantity of 108 must be ordered, and in units of 12 thereafter. 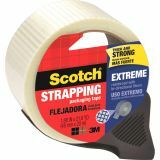 Scotch Bi-Directional Filament Tape w/Dispenser, 1.88" x 21.8yds, 3" Core, Clear - Extreme application packaging tape is designed for heavyweight and overseas/export shipping applications. Tape is reinforced with continuous glass yarn in both horizontal and vertical direction for added strength. Backing is abrasion-resistant, moisture-resistant and scuff-resistant. Packaging tape also meets postal regulations.